Bay Area Landless People’s Alliance meeting to discuss plans, outreach, organizing regarding regional homeless communities and organizations. You never want to miss out on a quarterly RPA membership meeting, but you’ll be especially regretful if you don’t make our April meeting! At the meeting we’ll be voting on whether the RPA should endorse Bernie Sanders for President — we encourage you to attend the meeting, share your thoughts, and vote. Full agenda coming soon. And of course, if you find that your membership has elapsed, you can always renew at the door. Come join East Bay DSA’s Medicare for All Committee as we discuss updates from the fight for single-payer healthcare and upcoming organizing projects. We’ll circulate some a short reading in advance, so please RSVP. All East Bay DSA members interested in getting involved with the Medicare for All campaign are welcome! On every ‘last Sunday’ we meet a little earlier at 3 PM to have a community potluck to which all are welcome. OO General Assembly has met on a continuous basis for over six years, since October 2011! Our General Assembly is a participatory gathering of Oakland community members and beyond, where everyone who shows up is treated equally. Our Assembly and the process we have collectively cultivated strives to reach agreement while building community. Come join us make public banking happen! Local public banking is coming to California! State Assembly Bill 857, which will enable cities and counties to more easily establish their own banks, passed two crucial votes this week: on Monday, the Assembly Banking and Finance committee voted to pass it, and on Wednesday, the Assembly Local Government committee did the same. Next, our bill is headed to the Appropriations committee before going to the full Assembly; then, of course, the debate will move to the Senate. The text of the bill, plus analysis and details on the committee votes, can be found here. Support for AB 857 is building; Los Angeles, San Francisco, San Jose, Santa Cruz, Oakland, and Berkeley�as well Santa Cruz Countty and Santa Clara County�have all passed resolutions supporting itt. Our grassroots movement to divest from Wall Street and keep our money local is growing ever more powerful. Onward! Have questions about public banking? Want to find out more about what we’re doing to make our own East Bay bank a reality? Come to Info Time! Volunteers will be available to talk with you from 5:30 to 6pm on Monday, April 29, at 2044 Franklin Street, Oakland. Drop on by for a chat—and bring a friend! Tell your assemblymember: Yes on 857! On Monday, April 8, California Public Banking Alliance (CPBA) volunteers from all over the state will converge on the Capitol to press for lawmakers’ promises of support for AB 857. But lobbying can’t do the whole job. Now is the time for all of us California supporters of public banking to call our assemblymembers and tell them to vote YES on this crucial legislation! Below are phone numbers for all assemblymembers whose districts include part of Alameda County. Wherever you live in the state, if you’re not sure who represents you, check this finder. And remember, everyone you know in California can call their legislator. Please ask them to call, too. It could make a real difference! We’re planning on doing a lot more tabling at markets and street fairs through the spring and summer, and we could really use some help. Tabling is a great way to get out of that cyber-bubble and talk to actual fellow citizens about creating the vibrant local economy we all want to see. You don’t need a finance background – just a couple free hours and an ability to explain the basics. You can also help by suggesting places for us to table. We need to connect with folks all over Alameda County so we can point to broad grassroots support for our bank as we push the Board of Supervisors to make it happen. If you’re interested in tabling or have an idea for a venue, please don’t wait to shoot us an email at contact@publicbankeastbay.org. Thank you! The Oscar Grant Committee Against Police Brutality & State Repression (OGC) is a grassroots democratic organization that was formed as a conscious united front for justice against police brutality. The OGC is involved in the struggle for police accountability and is committed to stopping police brutality. In alliance with the International Longshore & Warehouse Union (ILWU) we organized the October 23, 2010 labor and community rally for Justice for Oscar Grant. On that day the ILWU shut down the Bay Area ports in solidarity. Our mission is to educate, organize and mobilize people against police and state repression. Sisters and brothers! The Oscar Grant Committee invites you to join us in this vital struggle. Join Oakland Privacy to organize against the surveillance state, police militarization and ICE, and to advocate for surveillance regulation around the Bay. We fight against “pre-crime” and “thought-crime,” spy drones, facial recognition, police body cameras and requirements for “backdoors” to cellphones, to list just a few invasions of our privacy by all levels of Government. We draft and push for privacy legislation for City Councils, at the County level, and in Sacramento. We advocate in op-eds and in the streets. We stand in solidarity with Black Lives Matter and believe no one is illegal. Oakland Privacy originally came together in 2013 to fight against the Domain Awareness Center, Oakland’s citywide networked mass surveillance hub. OP was instrumental in stopping the DAC from becoming a city-wide spying network. Our major projects currently include local legislation to regulate state surveillance (we just got the strongest surveillance regulation ordinance in the country passed in Oakland! ), opposing Urban Shield and pushing back against ICE with local legislation. Check out our sister site DeportICE. Oakland Privacy works regionally to defend the right to privacy and enhance public transparency and oversight regarding the use of surveillance techniques and equipment. Oakland Privacy drove the passage of surveillance regulation and transparency ordinances in Oakland and Berkeley and is kicking off new processes in Richmond and Alameda County. To help slow down the encroaching police state all over the Bay Area, join us at the Omni. The capitalist economic system defines every aspect of our lives: the schooling and medical care we get, where we live, and how we sustain ourselves. The system works for a lucky few and exploits everyone else. And it’s a real threat to the survival of our species (and many others) on this planet. We know the system needs to change—but we can’t change what we don’t understand. We have to know what we’re talking about. Kate Raworth’s Doughnut Economics lays out traditional economic theory—still taught as gospel at all the major temples of capitalism—with clarity, authority, lots of graphics, and quite a bit of humor. She exposes the flawed models and persistent myths that keep the system in place. Even more importantly, she presents seven big, basic ideas with which to begin creating the world we want to see. We can indeed build an economy in the “doughnut”—meeting the needs of all while maintaining the biospheres that support us. All of us need to read this book. We’ve all grown up in this deeply unfair and absurd system; seeing it clearly and getting free of it require a group effort. So we at Strike Debt Bay Area are sponsoring a group discussion of Doughnut Economics. We’re doing one meeting a month on the 2nd Saturday; we’ll usually do about one chapter per meeting. Please join us! 4:30 – 6:00pm, Saturday, February 9th. We’ll be discussing the 4th chapter. 4:30 – 6:00pm, Saturday, March 16th. We’ll be discussing the 5th chapter. 4:30 – 6:00pm, Saturday, April 13th. We’ll be discussing the 6th chapter. 4:30 – 6:00pm, Saturday, May 11th. We’ll be discussing the 7th chapter and the concluding chapters, and discussion possible futures for the group. Bring the book (available at your favorite online bookseller and in select local bookstores) and/or your thoughts on the topic (The first and possibly subsequent chapters are available online – http://tinyurl.com/ycysqtde ‘Look Inside’). The book is an easy read (but full of ideas!) so it’s easy to catch up. The Oakland Tenants Union is an organization of housing activists dedicated to protecting tenant rights and interests. OTU does this by working directly with tenants in their struggle with landlords, impacting legislation and public policy about housing, community education, and working with other organizations committed to furthering renters’ rights. The Oakland Tenants Union is open to anyone who shares our core values and who believes that tenants themselves have the primary responsibility to work on their own behalf. The Oakland Tenants Union meets regularly at 7:00 pm on the second Monday evening of each month. Our monthly meetings are held in the Community Room of the Madison Park Apartments, 100 – 9th Street (at Oak Street, across from the Lake Merritt BART Station). To enter, gently knock on the window of the room to the right of the main entrance to the building. At the meetings, first we focus on general issues affecting renters city-wide and then second we offer advice to renters regarding their individual concerns. If you have an issue, a question, or need advice about a tenant/landlord issue, please call us at (510) 704-5276. Leave a message with your name and phone number and someone will get back to you. Come get connected with SDBA’s projects – we have exciting work to do in 2019! Our medical debt erasure campaign with RIP Medical Debt is doing well (but needs more signal-boosting). We joined another Alameda County campaign, and together we’re more than halfway to our minimum goal. Our donation page is here. The online version of our flyer, with live links, is here. Our FAQ is here. We can also link you to a printable version of the flyer if you have places to hand them out. 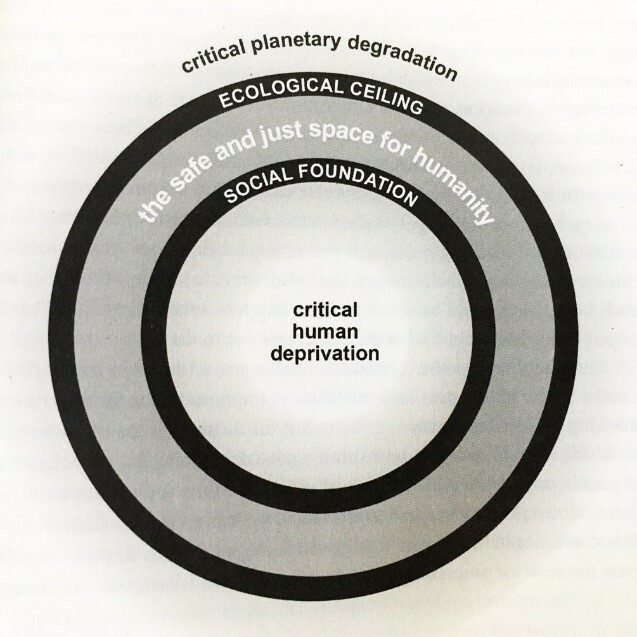 Continuing our discussion group on Doughnut Economics by Kate Raworth (moving on to Chapter 7 and the end of the book, on May 11 at 4:30 at the OMNI). 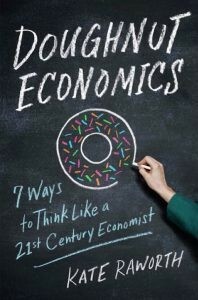 Two of the book group members entered the author’s competition for an 8th way to think like a 21st-century economist. Organizing for public banking in the East Bay! Public Banking East Bay (which overlaps significantly with our group) is also an active member of the California Public Banking Alliance. The Green New Deal envisions financing through public banks! AB857, which will pave the way for local and regional California public banks, is in committee hearings next week in Sacramento. Also check out our website, our twitter feed, our radio segments and our Facebook page.